A powerful storm brought everything promised -- wind, rain and snow -- to San Diego county on Monday morning. As of noon, there had been plenty of rain, some snow and some fairly strong wind gusts in the mountains. Steady rain started falling around 4:00 a.m. and by the middle of the morning commute, many of the freeways had turned into parking lots because of dozens of accidents. By 10:30 a.m., more than 100 accidents had been reported by the CHP. 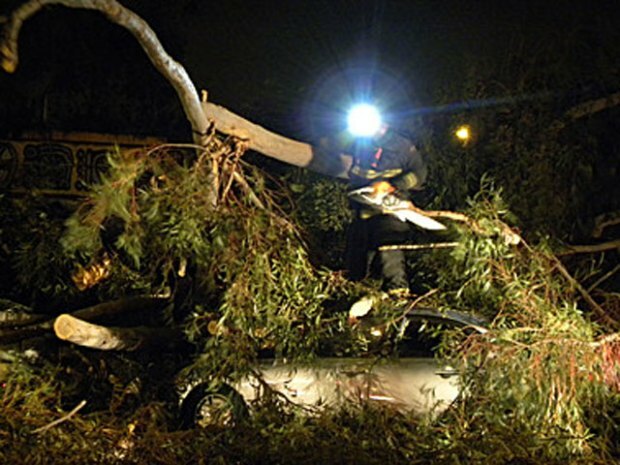 On a normal day, the CHP receives notice of 50 to 75 accidents in a 24 hour period. 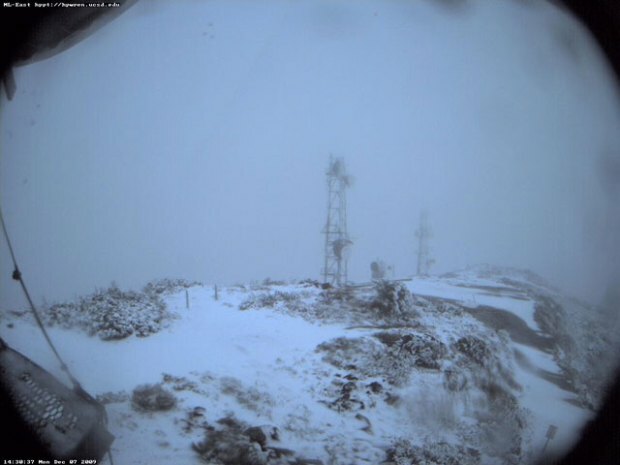 In the mountains, light snow started up before sunrise and, at the Laguna Mountain Lodge there were already a couple of inches on the ground as the resort operators opened for business. “It’s snowing and snow is sticking in the trees. Looks like a Christmas Card,” said John McWay. As much as 6" could be on the ground by tonight if it doesn't blow away. With the strong winds picking up later in the day forecasters are predicting blizzard conditions to develop. While rainfall amounts will vary widely from point to point around the county, in general terms we're expecting at least an inch near the coast, two inches or more in the valleys and up to four inches in the mountains below the 4,000' snow level. Along the coast, choppy waters kicked up before daybreak at Cardiff-by-the-Sea. There was steady rain along the northern coastline early Monday morning, enough rain to bring out "storm watchers" like Robert Wald before the sunrise. "I love it. I love the rain. But one day is about all I can handle before I need the sun again. I've got a solar-powered body," Wald said. The NWS has issued a high wind warning for the foothills, mountains and coastal areas from 3 p.m. to midnight Monday. Winds from 25 to 40 mph are expected during the evening and will gradually taper off through the night. The mixture of snow and wind could produce blizzard conditions on Interstate 8 and all of the mountains and higher passes late Monday into early Tuesday. Along with a high wind warning and the anticipated blizzard conditions in the mountains, you should also be advised that localized flooding is possible in the low lying areas prone to high water problems and, as the heart of the storm moves through during the afternoon and early evening, we could also see power outages and downed trees. If you're considering braving the storm and traveling east, bring chains and cash as phone service - and credit card machines - will likely be disrupted. 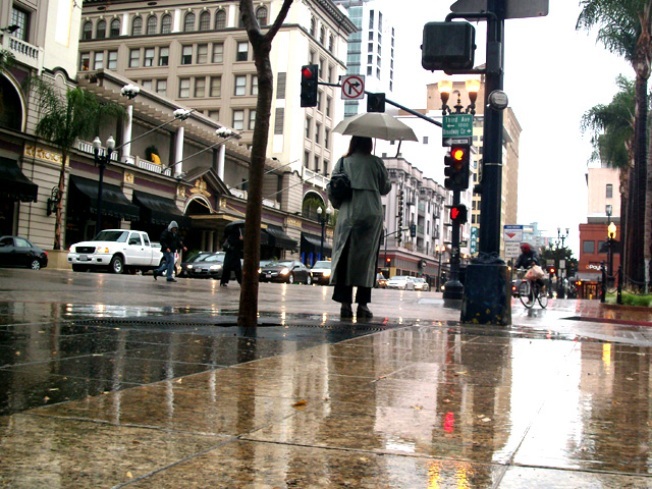 A second, warmer storm is due to arrive as early as Wednesday. The snow level will be well above 6,000' so San Diego mountains aren't expected to get anything but heavy rain. San Diego County is offering updates on road closures through Twitter. 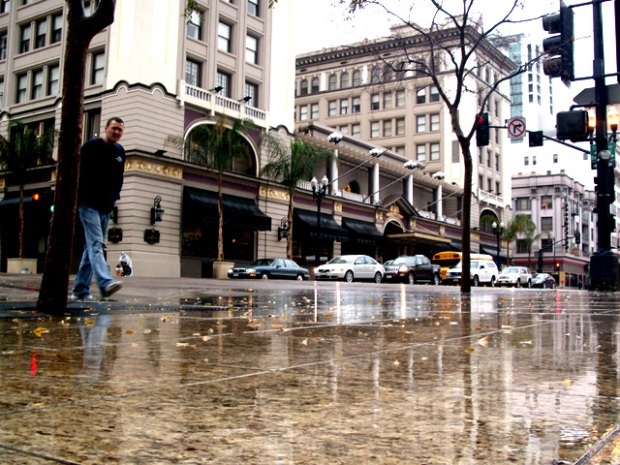 Send your storm and snow pictures to isee@nbcsandiego.com or upload them to our So San Diego feature on NBCSanDiego.com.